This image shows the temperature anisotropies of the cosmic microwave background, or CMB, as observed by ESA's Planck mission on the sky and displayed in an equirectangular projection. It is based on data from the Planck Legacy release, the mission’s final data release, published in July 2018; obtained by projecting the celestial sphere onto a rectangle, this image suitable for full-dome presentations. The CMB is a snapshot of the oldest light in our cosmos, imprinted on the sky when the Universe was just 380 000 years old. It shows tiny temperature fluctuations that correspond to regions of slightly different densities, representing the seeds of all future structure: the stars and galaxies of today. The image is shown in galactic coordinates, with the plane of the Milky Way running horizontally along the central row of the image, and the centre of the Milky Way in the middle of the image. Note that emission from the Milky Way has been removed from the image. The equirectangular projection is one of the many types of transformations that can be used to map the coordinates from a curved surface, such as that of the celestial sphere, onto a flat surface, for example, that of a sheet of paper. Due to the different characteristics of flat and curved surfaces, some properties of the original coordinate system – distances, areas, angles, and others – can be preserved in the transition from one map to the other, but not all at the same time. When mapping a measured quantity, such as the temperature of the CMB observed by Planck on the celestial sphere, onto a flat surface, a choice must be made about the type of projection to employ. Each type of projection preserves one or more properties of the original measurement and may suit different purposes. The equirectangular projection preserves angles but not areas. This projection is convenient for some graphics applications, since the typical image formats that are used in this field support rectangular images. Every type of projection introduces errors in the conversion process. For example, in the equirectangular projection, the error on the value of each pixel is larger as the distance from the centre of the map increases. The regions towards the upper and lower parts of this image are noticeably distorted with respect to the central part of the image. 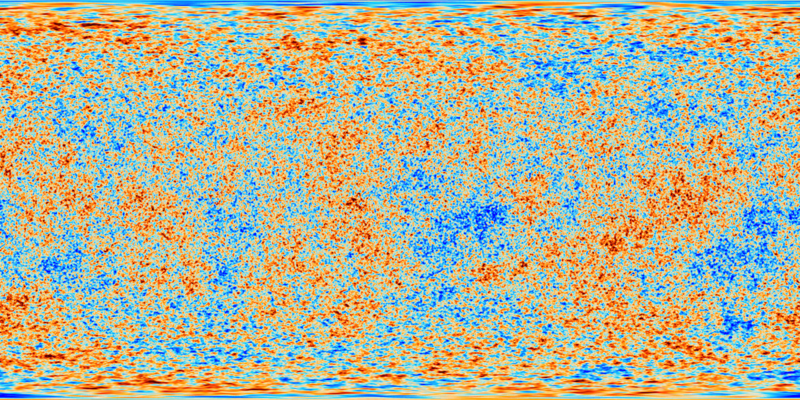 For this reason, this projection of the CMB is not intended to be used for scientific purposes. A version of this image tagged with meta data to view as a 360° image is available to download here [6350×3175 pixels, 34 MB].